Airbus Helicopters celebrated the tenth anniversary of its Albacete factory on Wednesday, underlining the essential role that the Spanish plant will play as part of the company’s new industrial strategy. The same day, a ceremony was presided in Albacete by the Spanish Minister of Defense, Maria Dolores de Cospedal, who took the opportunity to sign the handover certificate for two H215s to the Spanish Air Force’s 802 Squadron/RCC Canarias as well as two HAD/E Tigers and an NH90 for the Spanish Army Airmobile Force (FAMET). Along with production sites in France and Germany, the Albacete plant will become a centre of excellence for the manufacture of major components assemblies, bringing increased quality and competitiveness as well as long-term visibility for the industrial activity in Albacete. The Spanish plant will specialize in the production and integration of the rear fuselages of all Airbus helicopters for the global market. “We are especially proud of our 10-year presence in Spain and we want the country to be a key part of our shared project to maintain our status as the world’s leading helicopter manufacturer,” said Guillaume Faury, Airbus Helicopters CEO. “Adapting to the market situation, we have transformed our company to become more competitive and increased our industrial efficiency by specialising our production sites and expanding their competences,” he added. 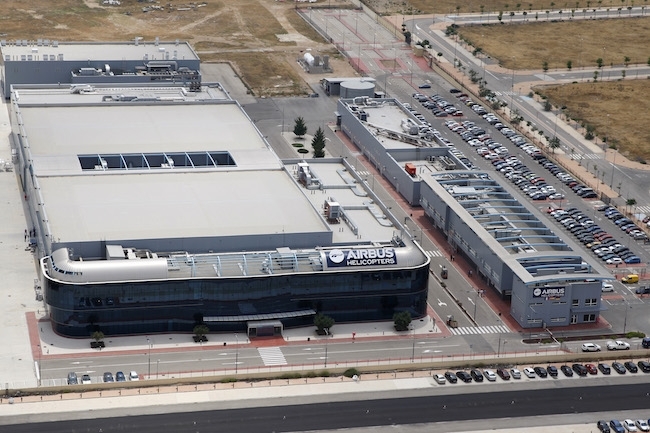 Airbus Helicopters’ strategy in Spain also includes the creation of a National Support Centre that will support the helicopter fleets of the Spanish Ministry of Defense. In doing so, the centre will perform a similar role to existing sites in France and Germany.